Innovative Toothbrushes that Will Rekindle Your Love of Oral Care - Diane W. Sherman, D.M.D. Brushing your teeth is crucial for excellent oral health and just about every adult knows how to brush. The issue that causes so many to neglect their oral care is entirely different: Motivation. When people miss brushing sessions their oral care suffers. One way to curtail this dental neglect is by boosting the fun of your brushing experience. By making it more fun, you’ll look forward to your oral hygiene sessions that much more. One way to do this is to find a creative new toothbrush, one that enhances your toothbrushing experience and makes it fun again. Since a basic toothbrush is enough to keep your teeth bright and healthy, the qualities you look for when upgrading your toothbrush may be more convenience or style-oriented. Some toothbrushes such as the hooked toothbrush enhance your convenience by expanding the number of places you can hang and store your toothbrush. Others are artistic and stylish variations of the basic toothbrush, designed with different materials and colors. For a toothbrush unlike any other out there, these ultra-sleek variations by Heritage are handcrafted. Designed to last a lifetime, the handle of these toothbrushes is comprised of 14K or 18K gold or black rhodium. The removable head is solid black and composed of 100% bamboo with respect to the environment. Available in two tones of gold, silver, or black rhodium, the Heritage Luxury Toothbrush is designed for a top-quality oral care experience. For a very cool toothbrush at an affordable price, check out the solar toothbrush by Soladey. Designed in Japan, the solar toothbrush operates with similar technology as a solar calculator, attracting electric ions into the bristles. This serves a valuable purpose as the ions destroy the bonds between plaque and your teeth while also killing bacteria on the toothbrush. If harnessing the power of the sun to clean your teeth sounds appealing, the Soladey-3 Toothbrush is for you. Eliminating the need for a toothbrush holder, the hooked toothbrush lets you store your brush on any shower head, towel hook, or ledge. This simple innovation will clear off space from your bathroom counter and allow you to find clever new ways to store your toothbrush. Throw in the fact that they’re available in five color options and only cost a few bucks, and the hooked toothbrush can make an excellent gift for your whole family. Another toothbrush that solves the problem of sanitary storage is the folding toothbrush. There are many brands of folding toothbrushes on the market, but their general concept is the same – borrowing from the design of a jackknife, folding toothbrushes fold into themselves to stay sanitary. Find them at very low costs and in various colors to switch up your brushing routine. However you choose to stay motivated to continue your oral care sessions, it’s important to remember that they’re crucial for overall oral health. 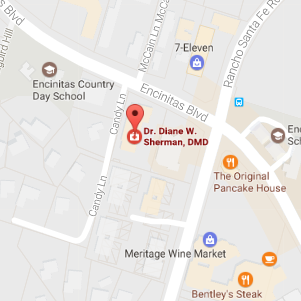 It’s also important to attend your biannual dental appointments at our office in Encinitas, California. Whether you have missing teeth or need a deep cleaning, Dr. Sherman and our team can help – Contact us today!